We and our 4 daughters, ages 13 down to 1, needed a home, and we needed it soon. Our 6-month lease was soon to expire, and our family was living a make-do lifestyle in an apartment. Everything about our living space spoke the language of “temporary” — some nearly-weightless plastic chairs; a white, wobbly table with a faded, vinyl tablecloth; the small black and white TV dug up at a garage sale for $10. The furniture ensemble was loosely sitting upon a bumpy sea of dusty pink carpet, completing the overall transient look. The wannabe “dining table” had just kicked off one of its plastic hollow legs again after a happy, screeching child, running giddily and directionless, had pushed into it. Even when the table was put together, we could watch it swerve and sway like a hula dancer every time someone brushed by. We were ready for larger quarters, with a roomy kitchen sporting all our dishes, a sturdy wooden table that wouldn’t fold under the strain of duty, and a wide, fresh, grassy yard for little feet to run their toes through. Lacy curtains billowing on the windows sure would be nice again, too. So, how to get those breezy curtains and more room for the children? Hire a real estate agent and pray, not necessarily in that order. For prayer, we figured we needed to power up things a bit, and magnify our prayers by including the prayers of a saint with some serious pull. That’s where St. Joseph came in. Being the foster-father of Jesus, who better to have on our side, with his earthly experience of carpentry and lovingly providing housing for the Holy Family? Not liking the idea of the current practice of putting a statue of him upside down in the dirt somewhere, we went no frills, choosing instead an old-fashioned St. Joseph novena. Along with the children, we began the novena, hoping for an affordable, 4 bedroom, 2 bath home. We (well, the grumpy grownups) wanted it without a pool. In steamy Florida, that is almost a heresy, but we had concerns for the safety of the girls, and pools require upkeep. However, unbeknownst to us, a pint-sized double agent was embedded in our midst, and she wasn’t supporting the party line. The thought of a delicious pool for her to leap into was irresistible. So, when you need to go over the heads of your parents, there’s only one thing to do. Go to a weightier authority, a.k.a., God. Better yet, pound on the door, as kids are experts at doing. A mere 5 yrs. old, our curly-headed pixie became a human megaphone to heaven. Small child, mighty prayers. “Let the children come to me, and do not hinder them; for to such belongs the kingdom of heaven.” (Matthew 19:15 RSV) Unfair? Perhaps. But how does that old saying go? All is fair in love and war? I guess this was war. We let our real estate agent, who handled foreclosures as well as regular listings, know what we were looking for. Later, after checking out many different homes, we were disappointed not to find what we wanted in our price range. Reality led us to tweak our requirements. “How about this one,” said Mr. Z, as he pointed to a listing, “it’s a foreclosure, but it has 5 bedrooms and 3 baths. It has a pool, though, and I know you didn’t want that.” As a foreclosure, we knew it could be a dump. But you just never know. When he told us the affordable price, Rich and I knew we had to see it. Unbelievably, it was less expensive than some of the smaller homes we had seen. Like a shy woman who doesn’t like to show off her fine qualities, there stood the home, modestly hiding the wealth of square footage waiting inside. The front façade presented more like a 3 bedroom dwelling, because you couldn’t see how far back the house stretched from the curbside. Upon entering, we saw that the house was empty and ready for a family, had new wall to wall carpeting, and had been freshly painted. The rest of our trek through the many rooms revealed new bathroom fixtures, recently installed kitchen counters, and a large screened in porch, leading out to a roomy back yard. Graciously draped over the back fence, was a generous old orange tree still heavy with juicy fruit. Even though it was an older home, we wouldn’t have to do a thing. Wow. Then we saw the pool. Not only was it bubbling, clean and invitingly aqua blue, it was big. About the size of what you’d expect at a motel. This place had “kid palace” written all over it. The girls, especially our little double agent, were thrilled. There’s nothing like a giant cement tub full of sparkling water to put a shriek in the throat, a spring in the legs, and a fire in the eyes! We’d have to get a pool fence for safety, but it certainly was doable with the great price of the home. It had become as clear as crystalline pool water that any parental resistance to owning this property was futile. Motivated by anticipation as well as financial practicality, we put in a contract. Later, the phone rang, with our surprised agent on the other end. “You won’t believe this, but the price of that house just dropped by $11,000. The phone has been ringing off the hook from other people wanting to buy it, but your contract got there first, so it’s yours.” Apparently, the house had been on the market for awhile, in a bad state of repair, and hadn’t sold. Consequently, a lot of work was done on it to make it livable again, and the repairs were finished just before we saw the house. Next, the price was lowered, which spurred a fresh flurry of activity on the recently upgraded property. But by the time the crowd discovered the ripe opportunity, we had made off with the spoils. Later, after we had closed on the house, Mr. Z, who didn’t strike me as the pious type at all, pointedly remarked to me how God had really been looking out for us. No, St. Joseph didn’t arrange things quite the way Rich and I had expected. We received more than what we asked for. Might it have been because God was going to send us 2 more babies? I think so, but the good Lord knows the reasons. 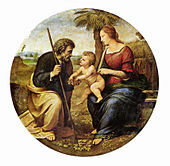 What’s more, St. Joseph expressed his love for our family and for Jesus by a most thoughtful kindness; he made sure we were well provided for spiritually, by locating us close to four Catholic churches. This wonderful saint left us a love note reminding us of the sovereignty and generosity of God. Like a good father, St. Joseph hadn’t overlooked a thing. Kathleen Woodman is a wife and mother of six girls, a grandmother, and an artist. She is a homeschooling pioneer (home educating since 1985), has taught many natural family planning classes, and has a B.S. in Business Administration.